Packaging supplies company Davpack has further expanded its range, with many of the new items on offer specifically designed to save their customers’ time and/or money. The start of 2014 has seen packaging suppliers Davpack introduce a host of new products to their already extensive range. Davpack designed a number of postal boxes to match the new size categories introduced by the Royal Mail last year, and these have proved incredibly popular. Now they’ve expanded the range even further to include two new options, which prove that packaging that can save a lot of money doesn’t have to look cheap. Added to the Post Office large letter size options is a new collection of quality white boxes which come with a strong self-seal strip. 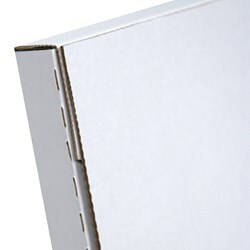 Made from light but tough ‘E’ fluted corrugated white cardboard, they’re quick to pack and seal, saving time on the packing line, saving on unnecessary extra packaging and saving about 75p on postage charges. Meanwhile, some sizes in Davpack’s range of Small Parcel Saver postal boxes are now also available in white, giving customers more ways to save on their delivery costs, while still ensuring they look classier than the average parcel. Also designed to save packing time are Davpack’s new wine bottle boxes, which come with integral cell dividers. Just unfolding the flat-packed boxes and sealing the base means the user is ready to start packing – taking up to half the time compared to the traditional method of unfolding and inserting separate dividers. Davpack have also introduced a new packaging tape, which they’re calling Extra Long D-Tape. With 150 metres on each roll – that’s over 2¼ times more than the average roll – it allows for faster packing, as less time is lost changing rolls. It also works out 15% cheaper than using equivalent 66-metre rolls. Davpack have been giving customers the chance to have their business names and logos printed on to their packaging tape for years, but previously only on to vinyl tape. Now custom printing is available on polypropylene tape as well, a move that makes the option almost 20% cheaper. Businesses interested in exploring new ways of sourcing packaging which can help their businesses get more competitive by saving both time and money can find out about these new cost cutting packaging solutions by visiting http://www.davpack.co.uk or by calling 01332 821200.